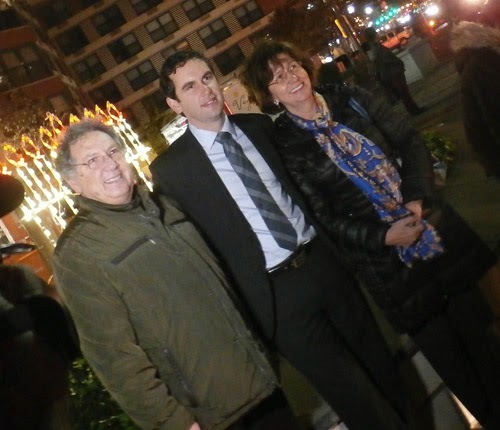 Jersey City’s first Jewish mayor lit his first municipal Menorah as mayor, kicking off the holiday season. Thanksgiving is more than a week away, the fates have conspired to push Hanukah to mid-November and after a chilly couple of days where winter wear including thick coats and woolen accessories were necessary, the weather changed to a sudden Indian Sumer. The plastic snowflakes may be up on the poles, but nobody was in the holiday mood. They were happy to be here anyway. There was a countdown and the switch was flipped and the lights of the Menorah and on the Christmas Tree went on simultaneously. Maybe not Rockefeller Center, but the glow was ours and that counts for something. I asked the mayor how it felt to be Jersey City’s first Jewish Mayor lighting his first Menorah. “It’s great,” he replied, utterly nonplussed. He sort of shrugged and mentioned that his family were holocaust survivors. I recalled he cited a Talmud parable during his inauguration speech. 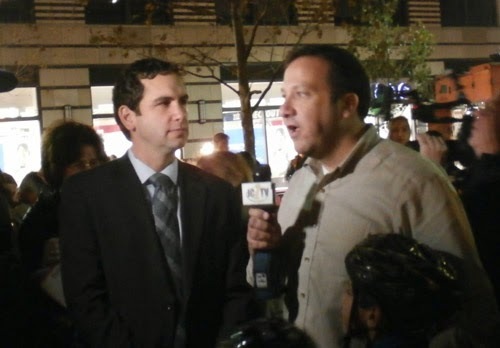 The Jersey City mayor is always accessible and a good-natured man. The event was fun. There was a nice-sized crowd, lots of kids. Rabbi Debra Hachen from Temple Beth El, who wore a yarmulke (ultra-reformed) gave a brief invocation, noting how strange and great that she was representing Jersey City’s religious community and thus was a rabbi wishing everybody their first merry Christmas of the year. A very Jersey City moment, our diversity and tolerance often results in idiosyncratic mash-ups that seem normal only to us. It was a dual menorah and tree lighting, even though the latter is really a week-after Thanksgiving rather than a week-before event. Why hold two separate events and risk outcry? There were cookies, an unusually brief playing of Christmas music that nobody sang along to. Everyone felt merry, but it was more just hanging out at the weekly green market merry than yuletide joy. The mayor mentioned there will be other holiday activities, something with Santa. Another old timer like myself remarked the well-worn refrain of how this sort of thing would never have happened years and years ago and how many more kids there are now. The thing about kids is they put everybody at their best behavior. Well, maybe not the best, but there’s less cussing or hostility when children are around. There’s more politeness. Guess that is at least a little bit of the old holiday spirit. 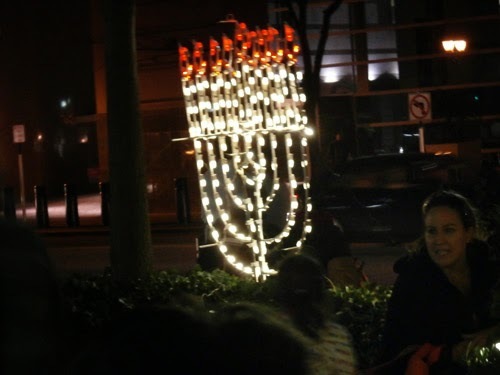 But no outcry and ironically, much outcry once accompanied Jersey City’s menorah. Our Menorah led to a case that was one of the first war on Christmas battlefields and is the reason why a city-sponsored Menorah and holiday decorations in general are not viewed by our justice system as a violation of the separation of Church and State. Anybody remember ACLU v. Schundler, 168 F.3d 92 (CA3: 1999)? The city then expanded the display beyond Tree, Menorah and Nativity Scene. Schundler added Santa Claus, Frosty the Snowman, a sleigh and Kwanza symbols, motivating the ACLU to file for contempt of court. What an in your face counter-offensive move by ole Brett. There was much interesting and sometimes intense discussion about these issues in the late 1990s and Jersey City had one of its occasional 15 minutes of fame. Some of the discussions form the basis of the annual war on Christmas blather, this years incarnation led by a new book by Sarah Palin, the right wing’s media-whore-in-chief. How much of a religious symbol is a Christmas Tree? Why cannot a Menorah also be part of what is now also a secular celebration? Hey, if a Menorah, why not a crèche? Why not Kwanza? 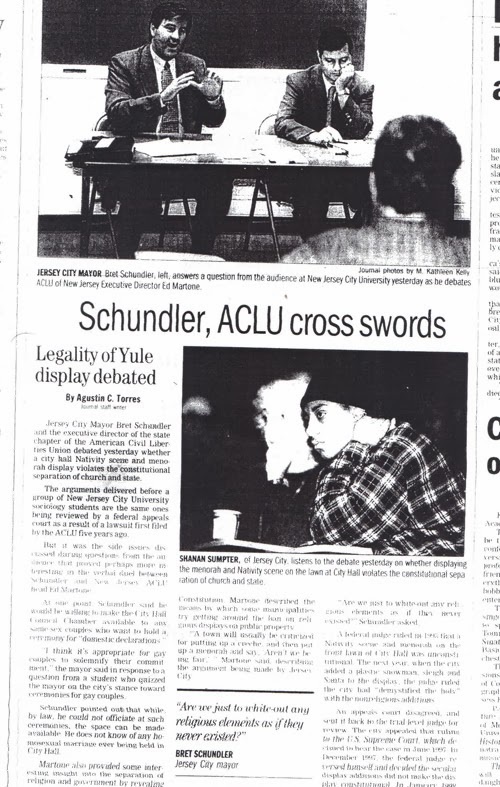 It seemed like a never ending chain – well, it ended with Kwanza actually – there was back an forth in the courts and in the public sphere, a wide wielding debate was held at City Hall between the mayor and the ACLU. The Federal District Court of New Jersey ruled in favor of the ACLU, but refused to rule on the contempt motion and the challenge was finally decided by the Court of Appeals For The Third Circuit. In a ruling written by future Supreme Court member Samuel Alito: "None of these displays conveyed a message of government endorsement of Christianity, Judaism, or of religion in general but instead sent a message of pluralism and freedom to choose one's own beliefs." Instead of following a court order to remove “religious” symbols from the city hall lawn, Schundler added more symbols. What would be the alternative, how can you remove the Menorah and let the Christmas tree stand? I do not see how the court could have ruled against the Menorah without also banning the rest of our Christmas decorations. By insisting that encouraging cheer, goodwill, and holiday rememberance is a proper function of city government, Schundler saved public displays of Christmas decorations. The ACLU wanted to be a Grinch, but the ruling showed that Christmas is bigger than religion. It no longer belongs exclusively to one religion. Another outcome is that the Menorah has become accepted as much a symbol of the Christmas Holiday as the crèche, candy canes, angels and elves. And, a Menorah can be lit by the first Jewish Mayor with little acknowledgement of the significance. Instead kids ate cookies and the JCTV filmed the mayor and the downtown improvement honchos as they recycled platitudes about how great these events are for the city. 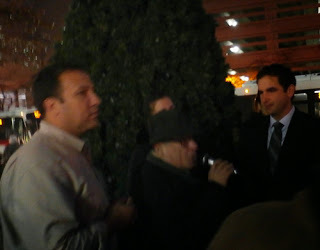 The event was basically a photo-op – the official TV one man cameras and other members of the press out-douched themselves in terms of rudeness and shoving people out of the way to get their bland photo-op shot. 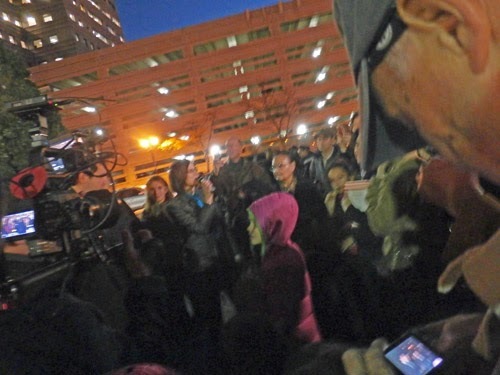 The only one caring about the kids were their parents, there was no question and answer session so to speak, just boosterism for the camera. There was nothing more to the event. Guess you have to go to YouTube if you’re interested. No one was ready for the holiday season. Who can feel the holiday Spirit when you still haven’t finished your Halloween candy? Alas… those in need of joy and goodwill will have to wait or look elsewhere than private/public partnerships. I have no idea what the official City Hall Holiday display will be this year. No worries about if this event had any religious endorsement. I love the fact our token member of the clergy is a woman rabbi wearing what most conservative Jewish sects consider to be an exclusively patriarchal symbol. 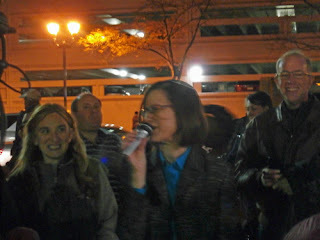 This Menorah lighting was all abut promoting local business. Appropriate and worth applauding. The Grove Street Pavilion didn’t even exist during the Schundler regime, and yet Schundler is why a Menorah can be funded by the city and bring people together and encourage shared happiness. 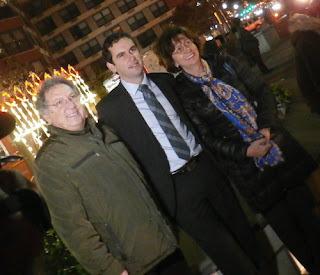 As the crowd dispersed, the Mayor and his parents posed for a picture in front of the Menorah. Maybe history’s best achievement is when the social collective can take it for granted because the ultimate meaning of history is personal.